Okay, I know I’m biased… but man, I have a cute kid! Hard to believe she’ll be talking back to her mom and stealing my beer one day. This entry was posted on August 8, 2008 at 12:04 am and is filed under Personal. You can subscribe via RSS 2.0 feed to this post's comments. 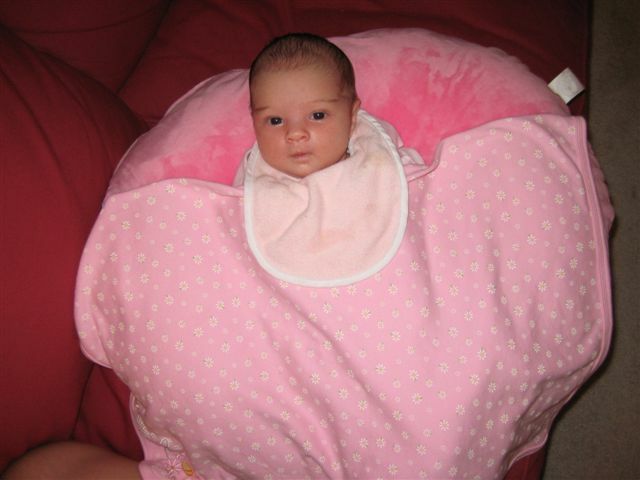 Rockin’ the boppy! Very cute. Congratulations. Gotta agree with you there, dude. She’s a doll! Hi, writerdad 303. I’m Writer Dad, I guess 905. It’s nice to meet you. Unfortunately, your daughter will probably talking back to her mother sooner than you think. Mine’s in her room right now thinking about what she’s done (it was exactly that). Anyway, nice to come across another writer dad. Have a great weekend. Of course you contributed to her DNA…she’s got your hair. Writer Dad — I can barely imagine my little one eating solid food, let alone talking back to Mommy. Of course, nine months ago I could barely imagine said little one actually emerging from my the lower half of my wife’s torso, so what do I know? 🙂 Good luck with your own literary pursuits, and thanks for stopping by! Wow, what a cutie! Ya done good.